Savvy Shopper’s Market. 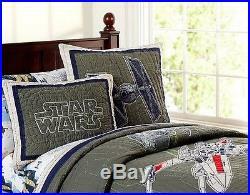 Young Jedi will love our exclusive The Empire Strikes Back bedding collection. The soft, cotton-canvas quilt features Luke Skywalker’s X-wing locked in battle with Darth Vader’s TIE fighter; surrounding the large appliqué is an embroidered Death Star trench background. Reverses to cotton percale. Shams have a quilted front and ties at back for closure. Quilt is filled with 270-gram-weight cotton batting. Expertly quilted by hand. Cotton percale and twill appliques. We are in no way affiliated with Pottery Barn. Our items are acquired through multiple sourcing opportunities available to our purchasing team around the country. Our goal is to pass along the savings to our loyal customers and create a care free and memorable shopping experience. We list each item with the >>Make Best Offer<< function as an opportunity to price match any competitor as we are committed to the best value to our customers. When you make an offer please reference where you found a better purchasing opportunity along with the price and our sales team will do their best not only to match but beat the better price! The items we carry are presented, listed and described to you with the best ability of our professional sales team. 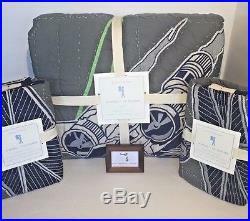 The item "MAKE OFFER $319 POTTERY BARN KIDS STAR WARS X-WING TIE FIGHTER F/Q QUILT +SHAMS" is in sale since Saturday, November 19, 2016. This item is in the category "Home & Garden\Kids & Teens at Home\Bedding\Quilts". The seller is "savvyshoppermarket" and is located in Maineville, Ohio. This item can be shipped to United States, to Canada, to United Kingdom, DK, RO, SK, BG, CZ, FI, HU, LV, LT, MT, EE, to Australia, GR, PT, CY, SI, to Japan, to China, SE, KR, ID, to Taiwan, ZA, TH, to Belgium, to France, to Hong Kong, to Ireland, to Netherlands, PL, to Spain, to Italy, to Germany, to Austria, RU, IL, to Mexico, to New Zealand, PH, SG, to Switzerland, NO, SA, UA, AE, QA, KW, BH, HR, MY, BR, CL, CO, CR, PA, TT, GT, HN, JM.